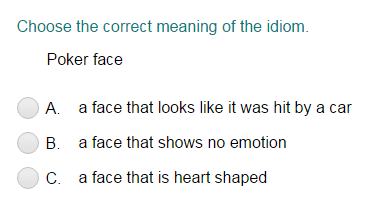 What did you think of Determining the Meaning of an Idiom ? Play more Idioms and Proverbs quizzes! An idiom is a phrase that means something different from the words that make it up. Usually, you cannot figure out what the phrases mean by looking at the meaning of each word. So, you have to remember them or figure out their meanings by looking at how they are used.